Verse-1 THE LORD is my Shepherd I shall not want. +As our SHEPHERD the Lord Feeds us, Leads us, Guides us, Guards us Protects us, and Governs us. +SHALL NOT WANT means we shall not lack anything or be in need of anything. He that spared not his own Son, but delivered him up for us all, how shall he not with him also FREELY GIVE US ALL THINGS. 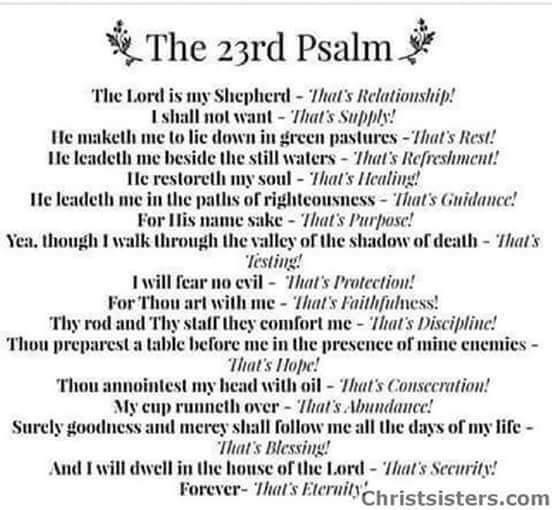 +The LORD is my Shepherd I shall not want. Verse-2 He makes me to lie down in green pastures: he leads me beside the still waters. +The Lord is our Shepherd which means we are His LAMBS and SHEEP. The Lord tends (cares for and look after) us with special attention like a Shepherd to His Lambs and Sheep. +He makes me to lie down in GREEN PASTURES means we are resting, thriving and flourishing in the care and presence of the Lord. +He LEADS me beside the STILL WATERS. The Lord gently guides us to the quiet waters similar to that which flows from the Throne of God in Revelation 22:1. +Heavenly Waters that refreshes, quenches and satisfies the thirsting of our souls. +He RESTORES my SOUL: he leads me in the PATHS of RIGHTEOUSNESS for his NAME’S sake. +He RESTORES my SOUL. Based on John 3:16, Romans 10:9-10, 1 Corinthians 2:16, 1 Corinthians 6:17, and 2 Corinthians 5:17-21 We have been Reconciled and Reconnected to God our Heavenly Father by the Redemptive Work of Jesus and the Work of Holy Spirit. +In our hearts we are one with the Spirit of God which is the RESTORATION of our SOULS. +The PATHS of RIGHTEOUSNESS are the PATHS of Love, Truth, Holiness and Faith. +We are led by the Spirit of God in the PATHS of RIGHTEOUSNESS for His Name’s sake. +When we walk in the PATHS of RIGHTEOUSNESS we are preventing others from BLASPHEMING the Name of our God. +THE VALLEY OF THE SHADOW OF DEATH are things the enemy will use to make you fearful. Remember it’s just the shadow of death. +I will fear no evil because God has not given us the spirit of fear; but of power, and of love, and of a sound mind, 2 Timothy 1:7. …for he has said, I will never leave you, nor forsake you. …I am with you always, even unto the end of the world. Amen. +YOUR ROD AND YOUR STAFF THEY COMFORT ME. +ROD represents God’s Authority and Power. +STAFF is all the sources of God’s Support for us. +God Comforts is with His Love, Joy and Peace in the Holy Spirit who is our Comforter, John 14:26. 5 You prepare a table before me in the presence of my enemies: You anoint my head with oil; my cup runs over. +God sees to it that our enemies know that He is our God and that He as our God provides for us even before the very presence of our enemies. +Anoint our heads with oil symbolizes that we are anointed with the Holy Spirit in Like fashion as Jesus our Lord was. +Our cups run over. The CUP represents our lives filled to the overflowing with the MORE ABUNDANT LIFE OF GOD in John 10:10.